The Oxford English dictionary defines the word compromise as being “an agreement or settlement of a dispute that is reached by each side making concessions”. Sri Lanka witnesed a political compromise of sorts between President Maithripala Sirisena and Prime Minister Ranil Wickremesinghe when the Sri Lanka Freedom Party (SLFP) and United National Party(UNP)leaders displayed a show of unity in bringing about a mini re-shuffle of portfolios among members of their cabinet. Officially it was a bi -lateral exercise between the president and prime minister who despite differences acted together in conformity with the constitution in effecting changes to the cabinet of ministers.Unofficially it was a trilateral exercise as former President Chandrika Bandaranaike Kumaratunga also played a constructive role in evolving a consensus and compromise in bringing about a cabinet re-shuffle. Due to the political compromise reached between President Sirisena and Prime minister Wickremesinghe with the endorsement of Ex-president Chandrika Kumaratunga, a minor re-shuffle of ministerial portfolios took place on Monday May 22nd. 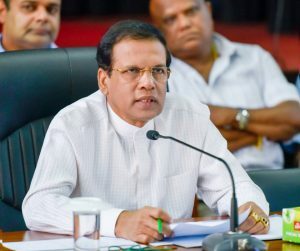 Nine Cabinet Ministers and one state minister were re-allocated fresh ministerial portfolios on the morning of Monday May 22nd in what turned out to be the first major re-shuffle since the formation of the current coalition Government headed by President Maithripala Sirisena and Prime Minister Ranil Wickremesinghe took office in August 2015.President Sirisena himself was the first to make the announcement that nine cabinet minister and a State minister had taken oaths before him after accepting their new portfolios. President Sirisena like the US President Donald Trump took to Twitter and tweeted “Nine Cabinet Ministers and a State Minister took oaths in their new portfolios a while ago”. 6. Gayantha Karunathilaka – Minister of Lands and Parliamentary Reforms. 9. Tilak Marapana – Minister of Development Assignments. The ten ministers accepted their letters of appointment from President Sirisena and took their oaths before him.Prime minister Wickremesinghe was associated with the president at the event. After the ceremony was over the re-shuffled ministers posed for group photographs with the president and prime minister. This demonstration of intra-govt unity for the benefit of the public was deemed imperative against the backdrop of reports in sections of the media that the envisaged cabinet re-shuffle was going to be a “solo”effort by president Sirisena and that Premier Wickremesinghe was totally opposed to it. An oft recurring headline in reports was that the proposed cabinet re-shuffle could make or break the Govt. Fortunately for all those desiring a stable, pluralistic, peaceful, egalitarian, well-governed and prosperous Sri Lanka, the re-shuffle ended on the positive note of making (or remaking)Sri Lanka. Speculative reports in the media had earlier suggested that President Sirisena was acting on his own without consulting Prime Minister Wickremesinghe in re-shuffling the cabinet. Subsequent events proved them wrong. The important decision to bring about changes in the allocation of certain portfolios as well as re- designation of some departments coming under the purview of particular ministries was not taken by the President alone.Instead of being a unilateral decision of the President, the mini cabinet re-shuffle decision was a trilateral one taken together by President Maithripala Sirisena and Prime Minister Ranil Wickremesinghe in conjunction with former President Chandrika Kumaratuga. According to well-informed sources President Sirisena and Prime minister Wickremesinghe arrived at a joint decision after much discussion on re-allocating ministerial portfolios and departments which was endorsed by former President Chandrika Kumaratunga. There was no question of President Sirisena going ahead with the reshuffle against the wishes of Prime Minister Wickremesinghe or taking a decision without consulting him reiterated the sources. Though Premier Ranil was earlier reluctant to agree to a re-shuffle of portfolios held by United National Party (UNP) members, he had later been amenable to changes it is learnt. Informed sources said that all provisions of the 19th Constitutional amendment regarding the President consulting and acting on the advice of the prime minister were adhered to. After in depth discussions the Constitutional requirement of the President officially consulting the Prime Minister and seeking his advice was met with. All the ministerial changes announced by President Sirisena were formally recommended by Prime Minister Wickremesinghe it is reliably learnt. Great care was taken to maintain a balance between the UNP and SLFP in the re-shuffle. Thus the swearing in ceremony saw a fifty – fifty ratio being kept between both parties. Five among the ten who took oaths belonged to or had contested on the UNP ticket. They were Mangala Samaraweera, Ravi Karunanayake, Gayantha Karunathilaka, Tilak Marapana and Arjuna Ranatunga. Former Sri Lankan cricket captain Arjuna Ranatunga belongs to a traditional SLFP political family in Gampaha district.. Having crossed over when Maithripala Sirisena split from the party, Ranatunga contested on the UNP ticket. Mangala Samaraweera is also from a traditional SLFP political family in Matara district. He was expelled from the SLFP by former President Mahinda Rajapaksa. Mangala then formed the SLFP (Mahajana) party and functioned independently. Later He joined the UNP. Five of the Ten who took their oaths belong to the SLFP or contested on the United Peoples Freedom Alliance(UPFA)ticket. They are S.B. Dissanayake, W.D.J. Seneviratne, Mahinda Samarasinghe, Chandima Weerakkody and Mahinda Amaraweera. Of these Mahinda Samarasinghe was a die -hard UNP’er from the Kalutara district who crossed over to the SLFP in 2006. Samarasinghe a former diplomat served as cabinet minister in the UNP Govt of 2001 -2004. After crossing over he became a cabinet minister in different SLFP -UPFA Governments. Senior politician SB Dissanayake also has had a chequered political career. He started out as a Communist and then became a SLFP’er. Later he crossed over to the UNP and then re-crossed back to the SLFP. After Sirisena became President, SB changed political stripes again. He was appointed a national list MP and cabinet minister by President Sirisena. 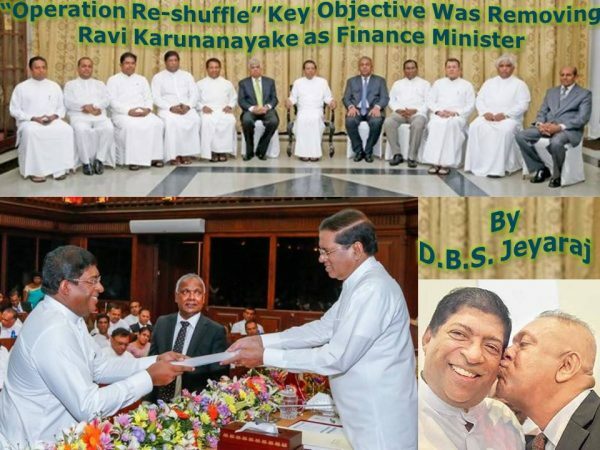 The most important and far- reaching decision in the re-shuffle was the key exchange of portfolios between former Finance minister Ravi Karunanayake and ex- Foreign Affairs Minister Mangala Samaraweera. 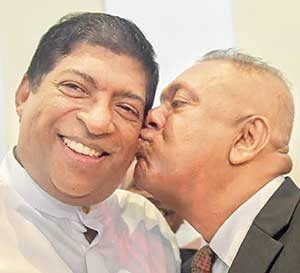 Karunanayake is now the new Foreign affairs minister while Samaraweera has become the new Finance minister, In addition to Finance, Mangala Samaraweera will also handle the media ministry. The former Mass Media and Parliamentary Reforms minister Gayantha Karunathilaka has lost his media ministry but will continue to retain Parliamentary reforms. Gayantha has also been allocated the Lands ministry and will continue to be the chief Govt whip. There are also reports that Ravi Karunanayake will be given additional responsibilities in various other spheres like Lotteries, Plantations, Aviation etc. These reports however need to be taken with pinches of salt until the relevant gazettes are out. While nine of the ten who took their oaths were cabinet ministers. One was a state minister.He was none other than Hambantota district MP and Cabinet minister of Fisheries, Mahinda Amaraweera who became the state minister for Mahaweli Development. The Mahaweli Development minister is President Sirisena himself. Mahinda Amaraweera will continue to retain the Fisheries ministry while having a greater role to play as Mahaweli Development state minister. President Sirisena relies to a great extent on Amaraweera who is aso the general secretary of the United Peoples Freedom Alliance(UPFA) Hailing from Hambantota district, Mahinda Amaraweera is the countervailing political force to Rajapaksa power in the region. The only comparatively “new”face in the cabinet is former Attorney – General and Ex -Solicitor – General Tilak Marapana . He was sworn in as Development Assignments minister. Marapane who served as cabinet minister in charge of Defence in the UNP led Government of 2001 to 2004 was also minister of Law and Order in the current Govt. He resigned in November 2015 following the Avant Garde controversy. Thereafter Sagala Ratnayake was appointed Minister of Law and Order. It was tipped earlier that Tilak Marapana would take over as Justice minister in this re-shuffle. This has not happened and Wijeyadasa Rajapakshe continues to remain the Minister of Justice as well as Buddha Sasana. Another anticipated change that did not materialise was in the sphere of Law and Order. President Sirisena had wanted to replace the present minister Sagala Ratnayake with former army commander Field Marshall Sarath Fonseka. President Sirisena has been toying with the idea of elevating Sarath Fonseka to a high position in the Defence or Law and Order sector with a lot of powers. When Cabinet spokesman Dr.Rajitha Senaratne publicised this “idea” there were howls of protest. Subsequently it was explained away as a “joke”taken seriously. However the president did not give up the thought and had wanted to replace Sagala with Sarath. The expectation was that Fonseka would come down hard on politically motivated protests and also expedite the ” pursuit of justice” regarding alleged abuse and misuse of power by the Rajapaksas. That change too has not been effected and Sagala Ratnayake remains Law and Order minister to date. The run up to the cabinet re-shuffle had been both exciting and hectic. The patently visible differences of opinion between the President/SLFP leader and Prime Minister/UNP Leader on this crucial issue was seemingly paving the way for an explosive confrontation and rupture of Government. In order to comprehend the political tensions more clearly a brief re-run of recent events is necessary.What had been happening was this. The president as de-jure head of government has been wanting to re-furbish the image of the Govt and galvanise it into positive action by making significant changes to the cabinet of ministers. The prime minister though agreeable in principle to a re-shuffle had not been amenable to some of the proposed changes. As a result the premier resisted the proposed changes and was not very co-operative. This was particularly so in the case of certain controversial cabinet ministers belonging to the UNP. This in turn led to an exacerbation of tensions between the SLFP and UNP factions of the Govt and by extension to the respective party leaders. A pro-Mahinda Rajapaksa cabal attempted to exploit these differences and engineer a permanent rupture between Maithripala and Ranil in this respect. The present Constitution introduced by the Junius Richard Jayawardene Govt in 1978 empowers the executive president to appoint and dismiss ministers as well as amend or transfer portfolios held by the ministers without consulting the Prime minister. However the 19th amendment to the constitution brought about by the Sirisena-Wickremesinghe Govt envisaged a greater role for the Prime minister in this. “(1) The President shall, in consultation with the Prime Minister, where he considers such consultation to be necessary, determine the number of Ministers of the Cabinet of Ministers and the assignment of subjects and functions to such Ministers. “(2) The President shall, on the advice of the Prime Minister, appoint from among Members of Parliament, Ministers, to be in charge of the Ministries so determined. (3) “The President may at any time change the assignment of subjects and functions and the composition of the Cabinet of Ministers and the continuity of its responsibility to Parliament. It was the avowed objective of the new “Yahapalanaya” or Good Governance Govt to abolish the executive presidency and enhance the powers of the prime minister. The 19th amendment was introduced primarily for that purpose. However a Supreme court ruling as well as certain conditions imposed by the SLFP component of the Govt acted as constraints. As a result the powers of the executive presidency were neither curtailed in full nor transferred to the prime minister. The govt hopes now to address these questions effectively if and when a new constitution is promulgated. Though the 19th amendment constricted the scope of the executive presidency, there was very little reduction of presidential powers in actual terms. However in practice President Sirisena evolved certain rules of political co-habitation with his Prime minister Wickremesinghe. This was necessitated by four factors. Firstly Sirisena was elected president through overwhelming support provided by the UNP and minority community political parties. He was therefore a President who was dependent on the UNP. Secondly Sirisena had become the nominal SLFP leader but in terms of realpolitik he was not in control of the party. The bulk of the SLFP rank and file remained loyal to Mahinda Rajapaksa. Thirdly Sirisena was trying to build up a political base of his own by enticing SLFP parliamentarians with the lure of ministerial portfolios and perks. Still those MP’s were smaller in numbers compared to the UNP. Fourthly and perhaps most importantly the UNP led front won the most number of seats in Parliament at the August 2015 polls. 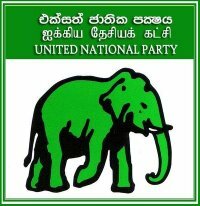 The UNP is the single largest party and main component of this Govt. The UNP leader is therefore the “legitimate”head of govt. Consequent to these factors, President Sirisena commenced his duties by restricting his role and duties in exercising his powers. While continuing with all the ceremonial duties of the presidency Sirisena took a backseat in the actual day to day running of the government. Though the president was the de jure head of the Govt , it was the Prime minister who functioned as de facto head of the govt. The memorandum of understanding between the UNP and SLFP laid down the groundwork of rules under which the coalition govt was to be constituted and administered. Thus the president in his official capacity appointed ministers , allocated ministries and assigned duties.However he did so after consulting the prime minister and acted upon his advice. The president and prime minister were in practice exercising concurrent powers or dual control over the Govt. This mode of political co-existence though laudable was not without its strains. The peaks and pitfalls faced by the Sirisena- Wickremesinghe Govt and the manner in which they were being surmounted or by-passed are by themselves an interesting and somewhat intriguing tale worthy of recounting on another occasion. This week’s column and the next one will be focusing on one important aspect which dominated the political discourse relating to the Govt in contemporary times – Cabinet changes! It was a crucial challenge which sorely tested the uneasy co-habitation between Maithripala and Ranil and threatened the fragile nature of the coalition government.How this intra-govt crisis of a cabinet re-shuffle was resolved temporarily through a political compromise would be the substance of this and a forthcoming article. As stated earlier President Sirisena wanted to re-furbish the image of his govt through a reshuffle of cabinet portfolios for certain reasons which need not be elaborated upon in detail at this juncture. In the process of a re-shuffle the President wanted to promote,demote, include and exclude several ministers and/or ministerial aspirants. There were some ministers who were not in the good books of the president for a variety of reasons. A few of these were from the UNP. Sirisena therefore required the consent and cooperation of Wickremesinghe to change some ministers and ministries from both the UNP and SLFP in an extensive cabinet re-suffle undertaken jointly by the President/SLFP leader and Prime minister/UNP leader. But Ranil Wickremesinghe was not willing to play ball with Maithripala Sirisena on this issue. The chief reason for this concerned Colombo district MP and cabinet minister Ravi Karunanayake. Arguably the primary target of President Sirisena in “Operation Re-shuffle” was the then Finance minister Ravi Karunanayake. President Sirisena wanted to remove Ravi Karunanayake from the Finance minister post and assign a diferent ministry or ministries to him. There was no objection to Karunanayake remaining in the government but the President did not want him to present the next budget in Parliament as Finance minister. Ranil Wickremesinghe however disagreed strongly with Maithripala Sirisena on this.The prime minister was unwilling to let go of his finance minister. There were political and personal reasons for this stance. Ranil Wickremesinghe is a clean and incorrptible political leader. Such leaders are a rarity in South Asia. Another oh his exemplary characteristics is his loyalty towards friends and colleagues who stood by him. Unfortunately some of Ranil’s friends and loyalists do not have “Clean”hands. So when Wickremesinghe stands by them he is vulnerable to charges of “cronyism”. The complicated situation was further compounded by the group of MP’s loyal to Mahinda Rajapaksa known as the joint opposition. The very same opposition which brought a no – confidence motion in Parliament against Ravi Karunanayake now began to sing his praises as Finance minister. They cited the “Banker”magazine selecting Karunanayake as Asia -pacific;s Finance minister of the year. Ex-President Mahinda Rajapaksa telephoned Ravi to express his sympathies at what was going to be Karunanayake’s impending fall from grace.Unconfirmed reptyrs stated Yoshita Rajapaksa had paid a courtesy call. « Muslim Owned Shop in Nugegoda Set Ablaze While Police Continue to Claim They are Searching for BBS Gen Secy Gnanasara Thero.